Heat the butter in a pan. Sauté the shallot briefly, add the rice and sauté until translucent, stirring constantly. Pour in the beer and reduce completely. Gradually add the stock and saffron, stirring frequently, so that the rice is always just covered with liquid, simmer for approx. 20 mins. until the rice is creamy and al dente. Mix the cheese into the risotto, season. Bring the beer and vinegar to the boil in a pan along with the shallot. Reduce the heat, reduce the liquid to approx. 2 tablespoons, strain, squeeze out the shallots. Return the liquid to the pan, heat. Add the butter gradually while stirring with a whisk. Return the pan to the hob a few times to barely warm the sauce; it must not boil. Stir until the sauce is creamy, season. Heat the clarified butter in a non-stick frying pan. Fry the scallops for approx. 30 secs. on each side. 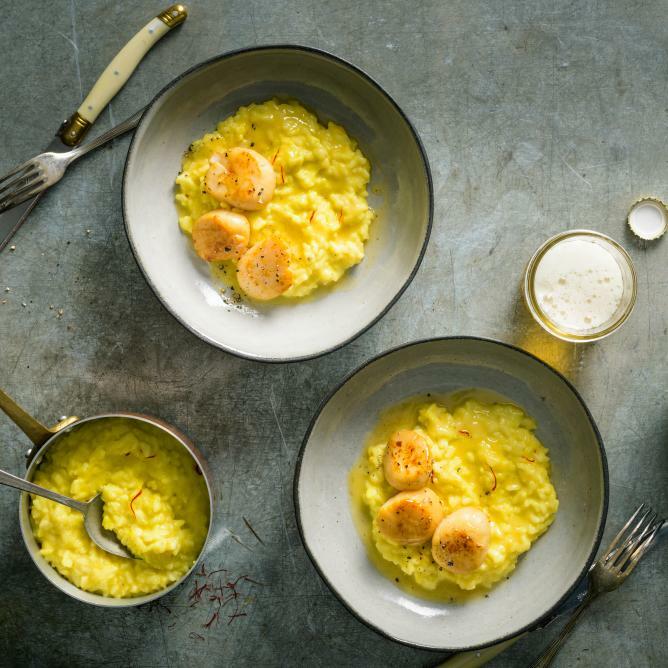 Serve the risotto on plates, place the scallops on top, drizzle over the white beer sauce.